Similar results have been found by [the United Nations Office of Drugs and Crime (http://www.unodc.org/documents/gsh/pdfs/2014_GLOBAL_HOMICIDE_BOOK_web.pdf), which states that countries with higher levels of firearm ownership also have higher firearm homicide rates. Here’s the bottom line. With these provisions, most U.S. active shooterswould have been denied the purchase of a firearm. 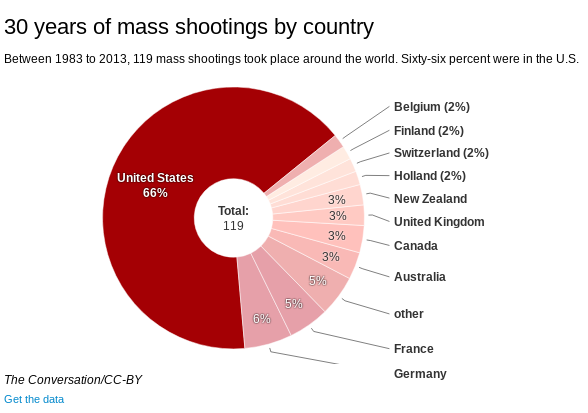 I am VERY sympathetic to the inquiry expounded upon, herein, but I really would like the “statistics per country” to be computed on a “per population” basis. Finland, for instance, has a population of 5.4 million, while the U.S. has a population of 319 million. Without such factoring, the raw numbers do not seem all that meaningful, and cannot be compared between countries. Reasonable? Well, it seems like those mindless idiots who chant `we´re number one´ are correct in at least this regard. Dangerous mental health issues will continue to create a PTSD society as long as we allow hundreds of tons of glyphosate on our food supply, in our waters, and air. Those issues plus an accessible gun are bad news. That’s why it says guns per 100,000 people. HI, Gary. As I said, I’m sympathetic to what the graphs are trying to show, but they don’t really show much. I was looking at the top chart, mainly, and without factoring in the population-size, the percentages don’t say much. 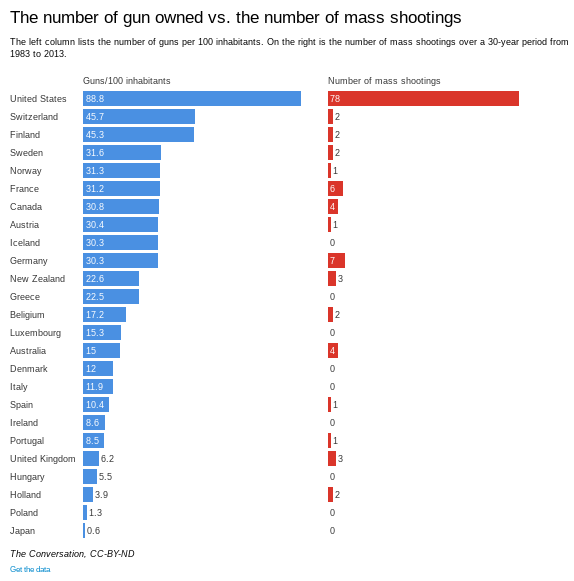 The bottom chart, while dramatic in appearance, does NOT show a correlation between numbers of guns owned, and gun-deaths — none of the other countries really fall into a significant pattern — just the top-bar pops out at us.